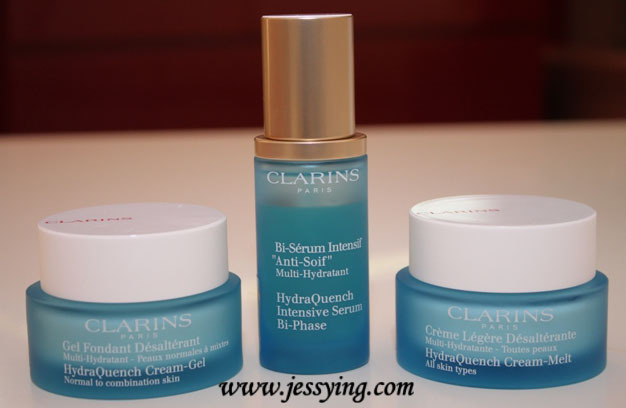 I have talked a little about this Clarins New HydraQuench range in my previous post and here are my thoughts after used HydraQuench Cream-Melt for 1.5 month. If you are a Clarins Hydraquench's user, you should know that Katafray extract is the main ingredients to the HydraQuench range and this has not been changed in the new formula. And the new thing in this range is rather the most talked about hydrating ingredient Hyaluronic Acid (extracted from the wheat) has been added into this new range to give more oomph i.e where it comes with two molecular weights, work to improve the protection of the skin surface and replenished dermal water reservoirs while katafray extract is to restore skin’s barrier effect and the production of natural moisturizing factors. Besides that the scent of the product also has changed to a more Floral-Fruity Fragrance. Clarins has engaged with a Japanese perfumer to create this special scent which is specially created for Asia people. It has the green apple as the top note giving the fresh scent, gentle rose as the middle note giving the feminine scent and lastly woody as the base note giving the relaxing scent. According to description, it is a non-oily, refreshingly soft texture that delivers the comfort of a cream with the lightness of a lotion. Leaves a silky powdered film that illuminates the complexion. Promise to give hydration all day. Strengthens the barrier effect of skin, optimizes the production of natural moisturization factors (NMF) and maintains optimal water reserves in skin. With Sorbier bud, it strengthens blood vessels that are made sensitive due to changes in climate and boosts microcirculation. 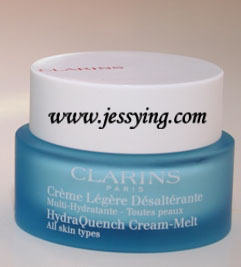 My review : I have a normal to dry combination skin and this Clarins HydraQuench Cream-Melt's texture is one which I like very much to use. 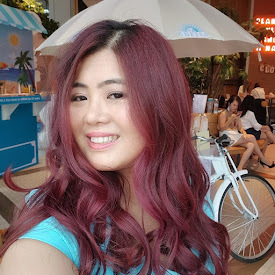 It is good to use during for day or night because it is lightweight and absorb very quickly into my skin upon application yet provide the needed moisture to my skin. As for the scent, I would personally prefer the old scent as it more mild and relaxing compare to this one which is more strong floral-fruity. Anyway the scent don't bother me anymore after a week of using it as I got used to it and usually the scent disappear after I applied on my skin. Overall, my skin hydration has improved and I could see my makeup seems to stay longer. Will repurchase this in the future ! Note : If you have oily skin, you can opt for HydraQuench Cream-Gel.